The Montreal Neurological Institute and Hospital’s Clinical Research Unit (CRU), will hold its 4th Annual Neuro National Clinical Trial Training Program on May 23 & 24, 2019 at the Montreal Neurological Institute and Hospital. Principal investigators, researchers, clinical research coordinators, and representatives from industry are invited to attend this two-day program covering education and training on: clinical trial readiness, medical monitoring, CROs, novel technology in clinical trials, consortium trials, trial design, drug safety, clinical trial outcome measures, and more. Past keynote speakers have included representatives from the pharmaceutical industry, small biotech, CRO representatives, Health Canada, and leading investigators in neurology and rare disease. The CRU, under the direction of Dr. Angela Genge, is involved in over 100 clinical trials in all fields of neuroscience. Its teams are experienced in Phase I-IV clinical trials, Investigator-initiated trials, bio-banking, and patient registries. The CRU has a unique model, employing specialized personnel in each of the major areas of clinical site management which encompasses finance, ethics, biological sample processing, coordination, nursing, and medical writing. Hotel 10 is a downtown Montreal boutique hotel located at the heart of Montreal’s entertainment district. Hotel 10 provides an exquisite experience with its personalized service, stellar amenities, and interior design featuring locally-made artwork. You are invited to feel at home and experience Montreal moments the way they were intended. To book with Hotel 10, please mention your guest affiliation with The Montreal Neurological Institute, in order to benefit from the preferential rate at the moment of your reservation. Individual reservation can be made by phone locally at +1(514) 843 6000 or toll free at +1 866 744 6346. Reservations can also be made through email by writing to reservations [at] hotel10montreal.com. The last-day with the preferential booking rate is the 7th of April, 2019. We encourage you to book as soon as possible, given the limited amount of rooms offered at the preferred rate. Hotel 10 offers rooms available from the 22nd of May (arrival date) up to the 25th of May (departure date). The rate per night starts at 199$ for a Privilege King room (subject to additional tax fees) with one king bed for single or double occupancy, and can be booked up to quadruple occupancy with 35$ extra per additional person. Complimentary services include Wi-Fi connection . The cancellation policy is 72 hours prior to arrival date. Offering a cozy atmosphere, historic splendour, and artful surroundings in downtown Montreal, Chateau Versailles is a historic hotel with a seamless blend of sophistication and comfort. Individual reservation can be made by phone at +1 888 933 8111 or through email by writing to reservations [at] versailleshotels.com. Please mention the group code MUE22S in proceeding with either mode of reservation. The last-day with the preferential booking rate is on the 22nd of April, 2019. We encourage you to book as soon as possible, given the limited amount of rooms offered at the preferred rate. Chateau Versailles offers rooms available from the 22nd of May up to the 25th of May. The rate per night starts at 179$ for a Deluxe 1 bed or a Deluxe Fireplace King / Queen at 189$ (subject to additional tax fees, single or double occupancy). Both rooms can be booked up to quadruple occupancy with 20 $ extra per additional person. Complimentary services include Wi-Fi connection and an expanded continental buffet breakfast served daily in Le Boudoir. Check in time is at 3:00 PM and check out time is at 12:00 PM the following day. Luggage handling is 6$ per person round trip, with a maximum of 2 luggage pieces per person. The hotel cancellation policy is 21 days prior to arrival. 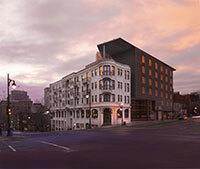 McGill University has agreements for special rates with several other downtown hotels. Follow this link to see the selection.